Carolina Panthers quarterback Cam Newton wears a Tykes shirt designed by UNCG alumnus Jason Woullard. Carolina Panthers quarterback Cam Newton knows how to make a fashion statement, and one of his most notable outfits of the season – other than those yellow zebra print pants – was designed by Tykes, a company founded by UNCG alumnus Jason Woullard ’98. 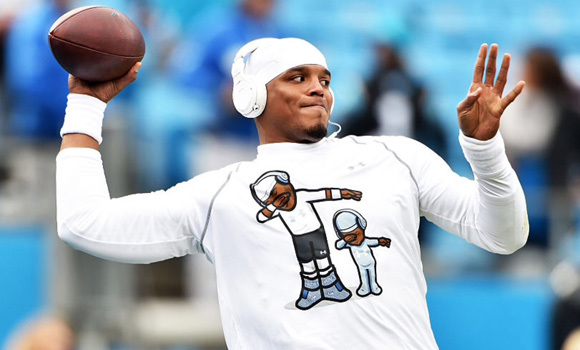 Newton sported a white, long-sleeved T-shirt during warmups before the Panthers’ game against the Seattle Seahawks last month. 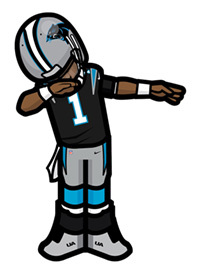 The shirt featured an illustration of Newton and his newborn son, Chosen, performing his signature end zone dance, the Dab. Tykes is a company that creates child-like images of famous athletes. The images were supposed to be a side project to drum up interest in Woullard’s sports database project, but with the help of social media, they took off on their own. Soon, athletes across the nation were asking Woullard and his fellow designers to create Tykes for them. They were even asked to design a series of tees for The Official Cam Newton Collection, with sales benefiting the Cam Newton Foundation. Woullard credits his training in UNCG’s Bryan School of Business and Economics for helping him become the business man he is today. “Coming up through the business school, I was able to understand the core of being a business man,” he said. WFMY has the full story. Are you pulling for the Panthers to win the Super Bowl? Share a photo or video of your best Dab on social media by tagging it #SpartanDab. Story by Jeanie Groh, University Relations. Photography courtesy of Ronald C. Modra, Sports Imagery.